The name of Annie Bousquet is no longer well known, although she was a very influential driver, albeit in an unfortunate way. Adopted Frenchwoman Annie died following injuries sustained in a crash at the Reims 12 Hour sportscar race in 1956. Subsequently, women were barred from ACO-sanctioned events in France until 1971, due to fears for their safety. This chiefly meant the Le Mans 24 Hours. The ban had an impact on many female drivers' careers, like Maria Teresa de Filippis, who was unable to drive in the French Grand Prix. Annie was born in Vienna, Austria, in the mid-1920s. Her exact date of birth is debated. Prior to her marriage to a Frenchman, Pierre Bousquet, she was known as Annie Schaffer. Pierre also raced, and it seems to have been through him that she got involved in motorsport. 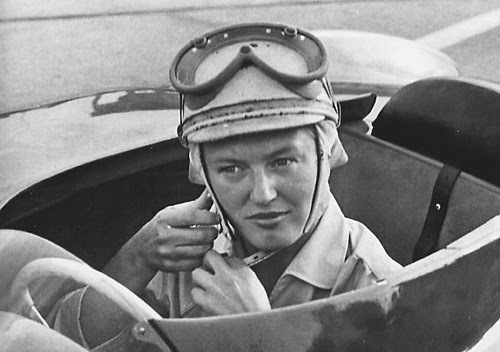 Her first forays into competitive motorsport were in 1952. She entered the Alpine Rally in a Renault, but does not appear to have finished. As well as this, she entered other rallies in Europe, with varying degrees of success. Annie's death put paid to a promising racing career, as well as making life difficult for other women drivers. She began circuit racing in earnest in 1953. Alongside the Belgian Gilberte Thirion, she came 16th in the Spa 24 Hours, using a Fiat 1100. Prior to that, Annie and the veteran Simone des Forest made the finish of the Mille Miglia in Annie's Renault 4CV. Annie, driving solo, also entered a race at Agen in a DB-Panhard, but it ended in a bad crash in which she was injured. The Bousquet/Thirion pairing were to compete again the following year in the Mille Miglia, in a Gordini T17S. This time they were 55th and fifth in the 1500cc class. They owned the car together and it was Annie's regular mount that year. She came sixth in the Agadir Grand Prix in Morocco and continued her African adventures in the Senegal GP. Closer to home, she won a qualifying heat for the Nimes GP, but failed to start the final with car trouble. There was more bad luck for Annie and Gilberte in the Sebring 12 Hours. The authorities were not keen on female participants and did not accept their entry. She had a better run in the Tour de France, in which she was eighth with Marie-Claire Beaulieu, driving a Porsche 550. This was one of her best results. Although Annie and Gilberte were still joint owners of the Gordini through 1955, they did not race it together. It was reported that the two had become very jealous of one another, whenever one got a better drive than the other. They competed separately from now on. The powerful Porsche gave her her best-ever finish, second in the Bol D'Or at Montlhèry with Josef Jeser in 1955. However, she was only an active participant for the first four hours or so of the race. Another driver had to have a leg amputated at the scene due to a serious accident, which made her lose her nerve and sit the rest of the race out. She was less successful in Agadir and crashed the Porsche, which had already suffered damage in an abortive speed record attempt at Montlhèry. 1956 was a turbulent year. Early on, Pierre Bousquet died in a traffic accident after skidding on ice. Annie, naturally, was badly affected and withdrew from competition for a while. During the spring, she resumed her career and accepted an offer to have another crack at the Mille Miglia in a Triumph TR2, driving for the works team this time. She came 95th. She also took advantage of an invitation to drive Alejandro de Tomaso's Maserati 150S in the Paris 1000km race. De Tomaso was her team-mate. They did not finish. The 550 that brought Annie her greatest success would also be her downfall. The Reims 12 Hours was her first major competition of the year in the car and she was sharing it with Isabelle Haskell, the American driver who was the partner of Alejandro de Tomaso. She crashed heavily on lap 27 and was thrown out of the vehicle. Although she was rushed to hospital, she was pronounced dead on arrival. Fellow competitors blamed fatigue on Annie's part, as she had competed in two very long races in succession as well as driven to the Porsche to and from a workshop before qualifying at Reims. This meant that she had probably not slept for two nights. During her life, Annie was considered a very competitive driver, sometimes excessively so, who was keen to prove herself against men and often took risks to do so. Certain observers claim that this competitive streak turned to recklessness following her husband's death, but this is conjecture. The turn at the Reims circuit where the accident happened is now named after Annie, and the Annie Bousquet award, for high-performing women in French motorsport, was created in her honour.